(Before) This lady, who lived over 2.5 hours away attended ‘not happy with appearance of her teeth’. It affected her confidence and she had ‘not smiled for 14 years’. She did not like the colour and shape of her teeth and she had a large space on the left side. (After) We carried out a wax up of models of the lady’s teeth achieving the appearance she desired. From these we were able to make provisional crowns so she could ‘try her new smile on’ for a couple of weeks before completion. 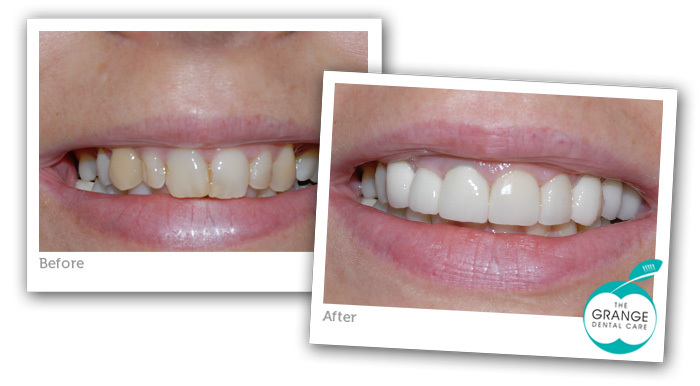 We whitened her lower teeth and restored her uppers with a combination of crowns, veneers and bridges. All these were made out of a hard non metal to help colour. All treatment was carried over a 3 month period.